I have never been one for church. I suppose I liked Sunday School enough. There were cotton balls and popsicle sticks and graham crackers and plenty of places to hide and snicker in the church basement. The service, though. That was another matter entirely. And not just because my buns ached from the hard pew (they did) or the sermon was dry (it wasn't) or the crotch of my tights were hanging somewhere around my knees (weren't yours?). No- it was because it just didn't make sense to me. I wasn't particularly captivated by the stories in the Bible, though I can go toe-to-toe with our school chaplin when it comes to recounting them. I did love the Christmas holiday and the dresses my mother made us for Easter, but it didn't take me long to figure out that the magic of those holidays was in the hands of my family- that crafted the ornaments on the tree, braided bread into wreaths, held me up to place the star, stitched each seam into place- and not in the palms of an invisible Him. And so, early on, I decided that I was an athiest. (I use the softer "heathen" for my mom's sake, and though she still threatens to baptize the Biscuit in a secret bathtime ceremony, I think he might foil her plans by peeing in the bath water and then threatening to drink it from a cup.) And this is why it was so funny this weekend to be constantly mistaken for a minister's wife. Mr. Frick officiated a wedding ceremony on Saturday. I won't give you all the details, though some of them are great, like the fact that a dog named Oscar Nascar was mentioned in the homily. I will just say that I was SO proud of him and the entire experience served to reinforce my belief that kindess and family-however you want to define it- are at the core of all that is good, and there's no way you or even an army of Hims can convince me otherwise. My mother also wants to secretly baptize LL. I keep the two of them away from water. My mother did secretly baptize Gus! She waited a full year to tell me. I'm still not sure what she thought my reaction was going to be, but she was real proud of herself. What Lola didn't mention is that our mom also baptized our sister's two kids while giving them baths . . . and she probably baptized her cat as well. Thankfully, I wasn't in a wedding this weekend (the last was Lola's and when someone tells you, "Buy a knee length black dress and you don't need to wear stockings," you kind of hope there aren't any more), but I am sure it was lovely. I agree, it's how we live every day that counts. Here's one I think you'll like. Sitting in a church every Sunday does not make you any more Christian than sitting your garage makes you a car. I believe, although attending the Catholic church after having been brought up Baptist is very interesting. I don't go often since my parents are still very Baptist. I've been meaning to tell you how much I love your photos, your knitting, and your wry wit! I'm so glad to have been introduced to your lovely blog. I look forward to future pictures, future stories. Great story. The flowers are lovely too. So true, so true. It just cracks me up that every "religious" person thinks that anyone who doesn't believe exactly what they believe is going to hell. I have no problem with people's beliefs, as long as they don't push them on me. I don't push Christians to become agnostic and feel I deserve the respect to make my own choices in that regard. I believe we all have the right to our own beliefs, whatever that may be. Also it is not the "going to church" once a week that is important, but how we live our life each day. Love the flower picture. 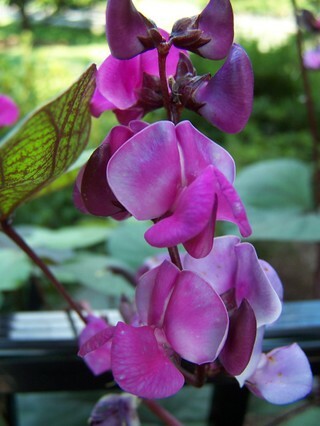 Great picture of the hyacinth bean flowers -- one of my very favorites, so much so I had some in my wedding bouquet, speaking of weddings. I absolutely love Christmas - it's my favorite time of year. And you're right that it's the family and friends that make it special hence the reason that I don't have any fond Christmas "church" memories...ok, ok it was kind of exciting to get to stay up late for midnight mass but in a dog going to the vet kind of way. Excited til you get there. BTW - I posted a Two Truths & A Lie contest - thanks for the idea - it was fun! Me, too, ditto on all that stuff! :) Love the photo! Love the blog--definitely great writing with perfect doses of wit, irony, and straightforwardness. I am always so afraid to speak about religion--I'm also a heathen--on my blog since I'm afraid of scaring away potential yarn buyers (I dye my own).